Henry Medcalf was born in 1834, and lived in Haverhill, Suffolk, working as an Agricultural Bailiff. He met one Ellen Pettitt, a publican’s daughter, and they married in Westminster in 1861. They moved back to Haverhill and had 3 children, including Andrew Medcalf in 1867. This is Alfred Smith, cropped from the photo above, which was the Ox Roast in Swan Field in 1897, for Queen Victoria Diamond Jubilee. After the death of Henry from tuberculosis in 1867, Ellen and her son Andrew moved to Woburn Sands in 1876, when Andrew was aged 9. He was known in the family as Drew Medcalf. They lodged with Alfred Smith, who was also a widower, and had two children. Alfred was a successful local businessman farmer, who employed 8 men and 3 boys on his 600 acres. Ellen and Albert got married in 1877 and lived in Horsegrove House, at 27 Station Road, with its extensive stabling, with over 20 loose boxes to house the horses in which he also dealt. In 1898, Andrew Medcalf had grown up, and married Miss Emily Lane. 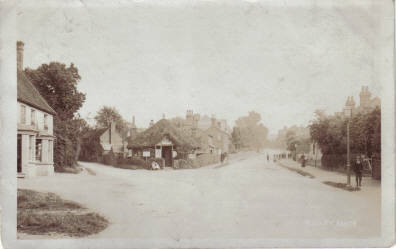 Miss Lane (formerly of Wavendon) ran the “Cyclists Rest”, a small thatched shop at the end of Weathercock Lane. They lived next door in Cherry Tree Cottage and had 5 children: Harold, Bill, Ellen, Reginald, and Francis. 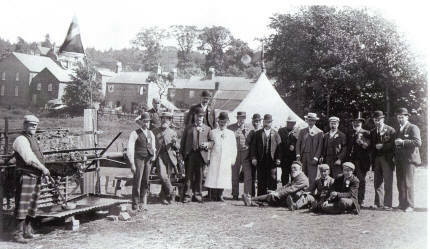 After the shop burnt down in 1905, she continued to run a tea room from Cherry Tree Cottage. I don’t believe they owned the shop or the cottage but only rented them. There is also a mention in an old family bible that I have of David Lane, Emily Lanes father, who was struck dead in a freak storm by lightening nearby in Walton, in 1871, aged 37. 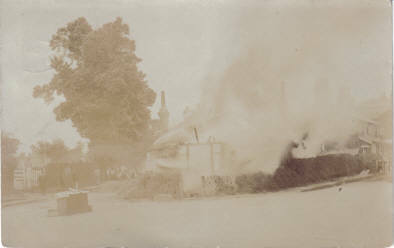 The Cyclists Rest, centre of the postcard left, before the fire, and below left and right are during and after the fire in 1906. 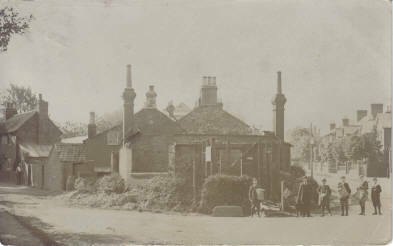 The incident was captured by local photographer Robert Cheetham, who produced these postcards. Fire postcard images courtesy of Mrs M. Yates, Aspley Guise. As a teenager, Drew Medcalf broke in horses at the rear of Horsegrove House and is registered in 1901 as a groom. In other documents, he is a Fly Cart Proprietor, working for Robert Cheetham the local photographer, in 1910; a Cab Driver in 1912, and then a Cab Proprietor in 1929. I believe he ran clients from the station to the Heath to take the air. He died in 1931. His widow Emily moved in with her daughter Ellen at number 33 Station Road and died aged 90 in 1960. Andrew’s son Reginald was a train driver, who married Beatrice Alice Mallard in 1925 and lived in Bletchley. He was very proud he was allowed to drive the Royal Train when it came through Buckinghamshire. They had two children Kenneth and Pamela. My mother Helen Robinson married Kenneth Medcalf in July 1960 in Wavendon Church by Reverend Wigge. They purchased an empty hairdressers which was a corrugated tin shop which used to lean on the side of Station Stores, Woburn Sands. My father Ken was the local electrician and worked in most of the houses in Woburn Sands. My mother Helen ran the tin shop selling electrical goods. They lived in the back of the shop. The damp brick floors would make the tin ceiling condensate and she can remember having to constantly mop it to stop the water dripping. 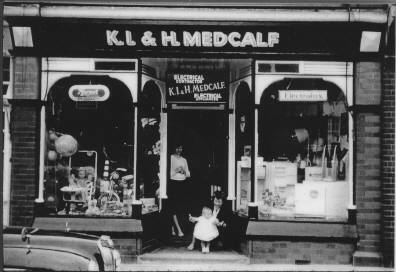 In 1961 they sold the tin shop for £1000 and purchased 71 High Street from Mr Shortland, which was a pram and cycle shop. They then ran a Toy & Electrical shop for many years. The people in the doorway are – my mother Helen Medcalf, my great aunt Ellen Thomas (Medcalf), and my sister Terry Medcalf. One of the staff, Molly West, with children from Ashleigh School. 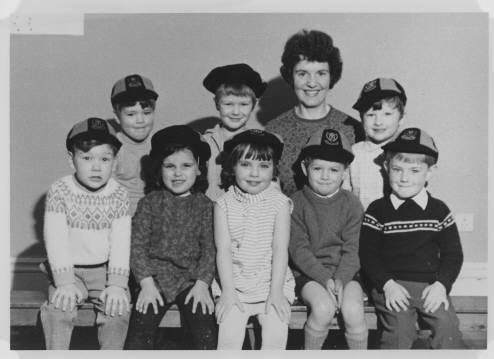 Helen also opened Ashleigh; a children’s nursery school in Station Road which concentrated on the 3 R’s (reading, writing arithmetic) from an early age. The school ran from 1967 for 30 years until mother retired. They even had a school uniform and a cap with the Ashleigh monogram on. Many local children started their education there, including Lord James Russell from Woburn Abbey. If you have recollections of Woburn Sands before 1950, or perhaps know a relative who does, why not jot down some of those memories, or record them onto tape, before they are lost forever. Soon that era will pass out of living memory. If you have an elderly relative, you could discuss the people and places detailed above, and see if they can add any information. Or you could cover similar subjects as those above, or school days, early jobs, what was done for entertainment, anything really! I would be pleased to transcribe any tapes you make and add anyones memories to those already on this site.